The headset doesn't offer a lot of frills, but is lightweight, has detachable parts, and sounds great to boot. When someone sits down to work or play games, the expectations of a headset can vary wildly from one person to another. The average length of time you expect to wear it per session should be a major factor in choosing a headset. As it turns out, the Creative Sound BlasterX H5 is a headset I can comfortably wear for hours. Float like a butterfly: Lightweight with a durable and flexible headband; great stereo sound; detachable mic and cable. Sting like a bee: Analog connection only limits you to the quality of your sound card; ear cups don't rotate along z-axis. When I first opened the package, I noticed how much the H5 reminded me of the Kingston HyperX Cloud IIs we love. The metal frames that hold the ear cups stood out, as did the removable, bendable mic. If you didn't know better, you could mistake the headset for the Cloud IIs from a distance. The first thing that's key to know about the H5 is that this is an analog stereo headset, and doesn't have any surround capabilities built into it. You can emulate surround in software with Creative's BlasterX Acoustic Engine software (which you have to register an email address to download), but the H5 itself isn't billed as a surround headset. Lots of vendors offer surround supplied by software (like Logitech, for example), but since the H5 uses an analog connection, that sound quality will only be as good as your sound card, and won't show up as a device running its own drivers. On the upside, this also means that the headset will work equally well on Windows, Linux, and your phone. Even though this is a set of stereo cans, they sound damn good, and on par with the Cloud IIs in terms of audio response and quality. The isolation offered by the soft leatherette ear pads are on par with the Logitech G633, and feel much more like a hug on the sides of your head. Ear cup material preference is something that's highly subjective, but these pads do feel comfortable for long periods of wear. However, the material will lend to a little more sweating for long periods of gaming in warm temperatures. It's still winter at time of writing, so the pads are quite comfortable. When talking about feel, it's important to note just how feather-light these cans are. While some may not mind heavier headsets like the Polk Audio Striker Pro, gamers who don't want to feel the pressure of headset on their noggins for hours will see the H5 as a breath of fresh air. The H5 feels a touch lighter than the G633, without the bulkiness. For portability, both the H5's mic and cable detach from the headset. The detachable mic and not-so-over-the-top design makes the headset suitable for wear away from your PC as well, so tip of the hat for a street-friendly design. The cable terminates in a mic/stereo 3.5mm male jack, which can be inserted into the included 3.5mm mic and stereo splitter for use with a PC with discreet input and output female jacks. The in-line control on the cable features a mic mute switch, volume control, and a dual-function play/pause and call answer button. One thing I really like about the headset is the headband; it's more robust than it looks, springing back into place after we bend it up so that the headband is nearly flat. Creative did this by using steel underneath the padding instead of plastic. While doing this with other headsets often makes me cringe, the H5 happily takes the bending in stride. One thing that seemed to be missing is that the H5's ear cups don't rotate along the z-axis. (If you're holding the headset upright, you can't twist the cups from left to right.) As someone who used to DJ as a hobby, I have a habit of lifting one ear cup off my ear to listen to someone. A rotating ear cup allows the wearer to do this without adjusting the position of the other ear cup. It's not a huge omission (and would have added to the headset's weight), but it's a feature that both the G633 and Striker Pro have that I would've liked to see. 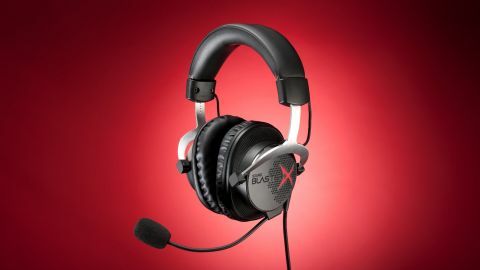 All in all, the Creative Sound BlasterX H5 is a great lightweight stereo headset. It's not much to look at, but for a no-frills set of cans, the H5 gets the job done and doesn't break your neck doing it. With audio quality that you'd expect from the HyperX Cloud II if you bypassed the USB device and plugged the 3.5mm jack directly into your PC, the H5 is a great headset. At $130, the H5's price is higher than the Polk Striker Pro P1 ($100), but the H5 delivers great sound in a lightweight package. Creative is one of the oldest players in the game when it comes to sound on the PC. With PC memory companies (Kingston, Corsair) edging in on the audio peripheral market, it's good to see Creative's Sound Blaster brand compete in a space that it helped create. I'm pleased with the H5, and we're looking forward to finding out how the Sound BlasterX H7 (the USB 7.1 surround version) performs.